Members of the Caladium genus are half hardy perennials and bulbs, but as they can not tolerate frost they are usually grown as ornamental annuals by gardeners. They are a commonly grown house plant. They are also known by common names such as Angel wings, Lance-leaf Caladium, Heart of Jesus, Elephant's Ear and Mother in law plant. 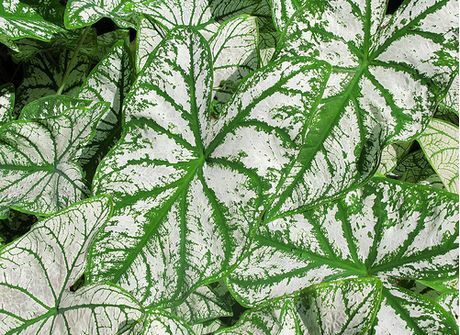 Caladium plants can reach a height of 30 to 60 cm and are grown by gardeners who prize their variegated leaves, which are often striped red, green or silver. Plants like to grow in hot areas and are ideal as both a container plant or when grown in mass in beds and borders. They are a very useful plant for adding season long color to shady parts of the garden. 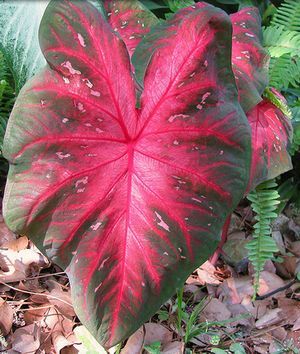 Caladium plants do not have a flowering season; they are grown for their wonderful foliage; leaves may be heart or lance shaped. Photographs by Tanaka Juuyoh and Turtlemom4bacon. The Caladium genus is a South America genus of plant that belongs to the Araceae family. Although there are only 11 or 12 members in the Genus, their popularity with gardeners, especially with 18th century Europeans, has led to the creation of over 1000 different cultivars of the Caladium. Caladium bicolor - These cultivars have heart shaped leaves. Caladium schomburgkii - These have lance shaped leaves. As one of the 107 genus members of the 3,700 species Araceae family, Caladium are closely related to plants such as Anthurium, Arum, Zantedeschia, Colocasia and Xanthosoma. This family of plants are classified as having an inflorescence that is known as a spadix, which is often, in part, enclosed by a leaf. Common Names: Elephant's Ear, Angel Wings, Lance-leaf Caladium, Heart of Jesus, Mother in Law Plant. Growing Region: Zones 4 to 10. As a perennial in zone 9 to 10. Flowers: N/A Grown for its foliage. Flower Details: Colour: N/A. Inconspicuous. Foliage: Green, pink, purple, gold, silver, cream, white. Cordate. Lanceolate. Variegated. Sow Outside: Cover fresh seed; plants do not often come true from seed. Corm: 2 inches (5cm). Best started indoors. Sow Inside: Germination time: one to three months. Temperature 75 to 84°F (24 to 29°C). Start bulbs indoors towards the end of winter. Transplant outdoors in late spring/early summer; minimum temperature should not fall below 60°F (15°C). Requirements: Full sunlight or light shade; best results in full sun. Good drainage. Soil pH 5.5 to 6.5. Rich soil. Moist soil. Mix in manure. Regular feed. Regular watering. In cooler areas restrain from watering in the autumn and bring tubers indoors before they are subjected to frost. Store in sand in a cool dry frost free place. In frost free regions, tubers can remain in situ over the winter, but do not water. Propagate: dividing tubers in the spring; each tuber should contain two eyes. How to plant Caladium bulbs - If planning to grow Caladium plants then it is best to grow from tubers, these should be buried at a depth of 5 cm in the spring. If you have seeds they normally take one to three months to germinate at a temperature of 24 to 29 degrees Celsius. If growing from seeds (only in warm areas, with no chance of frost), then they should be used fresh and once sown lightly covered with topsoil. Caladium seedlings should then be put out with a spacing of around 20cm into a rich acidic soil in a sunny part of the garden. Although best foliage color is produced when grown in sunny areas of the garden, these plants are also attracted in shady parts of the garden. Caladium care is pretty simple: plants need to be watered regularly during the summer. In very cold areas it is necessary to remove Caladium plant tubers out of the soil and take indoors (store in sand) at the end of autumn to protect them from deep frost. Propagation is best in the spring, split the tubers, ensuring that each new tuber has at least two eyes. Caladium bicolor – Common names include Fancy leaved Caladium, Elephant Ears, and Angel Wings. Commonly grown cultivars include Florida Cardinal, Raspberry Moon, and Scarlet Beauty. These plants are grown for their beautiful foliage, leaf petioles grow directly out of the bulbs and may reach 6 to 12 inches (15 to 30 cm), they then bear an heart shaped, variegated leaf, leaves may contain green, white, pink, red, or grey colors. Caladium like to grow in warm climates and therefore should be treated as an annual in areas that are subjected to frost. They also make beautiful house plants. Space at about 6 to 10 inches (15 to 25 cm). Plants can be grown as perennials in zones 9 to 11, and as annuals in other areas. However, even if you live in a frost free area, it may still be necessary to bring tubers indoors if you live in an area that gets a lot of winter rainfall, as tubers may rot.